> Ask seven girls and women of all ages to read these statements about Wisdom relying on the TEV. Or, ask one older woman and a young girl (maybe a mother - daughter or grandmother - granddaughter pair?) to read alternate reader’s lines. although she herself never changes. people who are at home with Wisdom. but evil never overcomes Wisdom. and she sets everything in useful order. > Thinking about Wisdom led me to search for wise characters in children’s literature. There is Jiminy Cricket to whom the puppet Pinocchio learns to listen, Glinda (the Good Witch of the South in Oz), even Majory the Trash Heap (Fraggle Rock). And there are the sages of fantasy literature –Dumbledore, Gandalf, Galadriel, Yoda, Merlin, and Obi-Wan Kenobi. Question to ponder: Am I right that though many older children’s stories feature a wisdom figure, few of the current movies do. 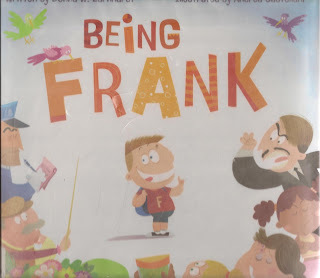 Instead the young heroes and heroines figure it out on their own often trusting their own instincts rather than the rather misguided ones of others (even parents) around them? Nashville, TN. http://diglib.library.vanderbilt.edu/act-imagelink.pl?RC=54977 [retrieved August 20, 2015]. 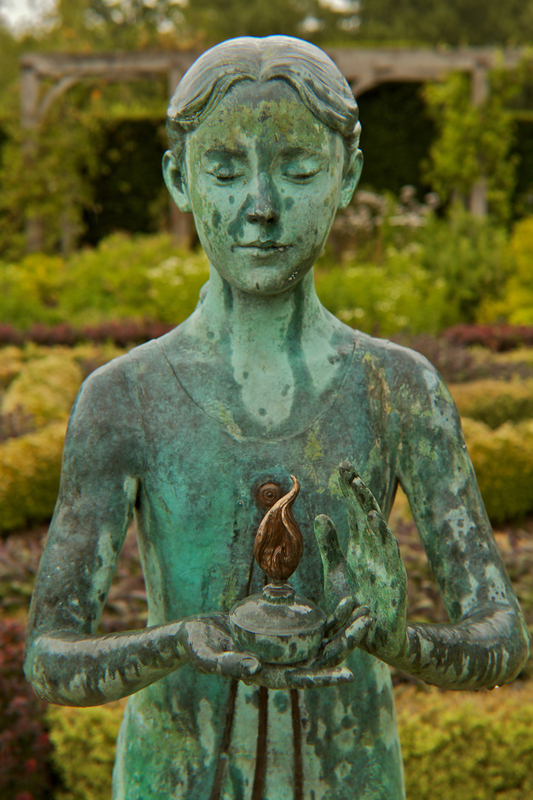 > Display this picture of a sculpture of Wisdom asking a series of questions to explore what it is saying: This is a person who stands for Wisdom. How old do you think this person is? 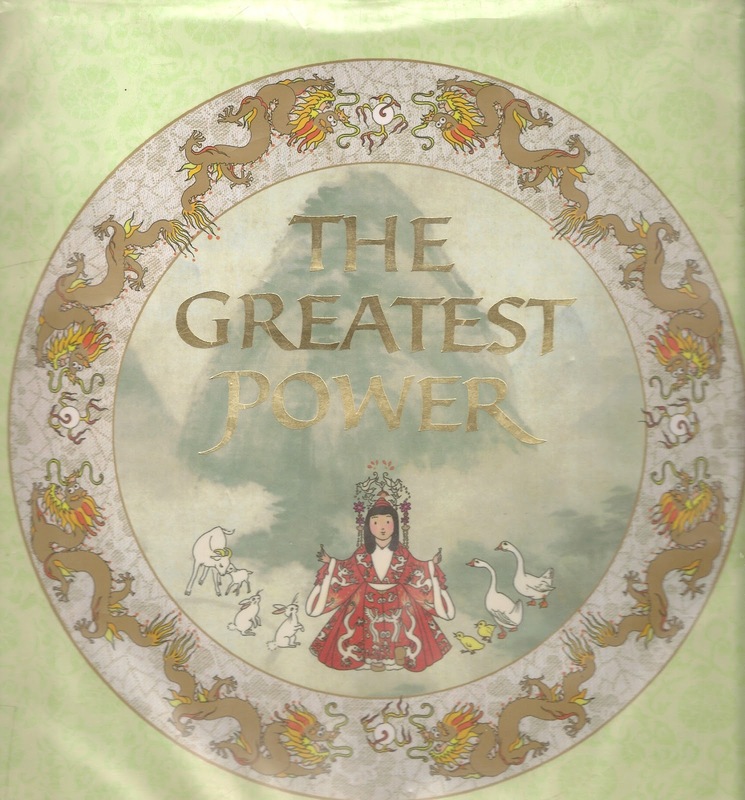 > The Greatest Power, by Demi, tells of a Chinese emperor who needs a wise prime minister and to find this person invites the children of the kingdom to think for a year about what is “the greatest power.” Children come in with examples from Chinese inventions, money, beauty, etc. 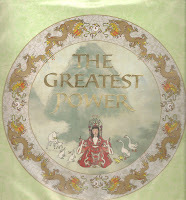 Sing brings a single lotus seed because the seed has the power to recreate life every year. > If worship will focus on Wisdom today, create a Word Search using wisdom words that will be used in prayers, readings, and sermon. Give it to children at the Call to Worship encouraging them to circle or star each word every time they hear, sing, pray or say it. Go to Puzzlemaker Discovery Education to make a free word search using words of your choosing. > Heads up! Psalm 19 appears again in Proper 21 on September 27th. > The RCL suggests reading the entire psalm today. With children I would start reading with verse 7 to focus on the Law and would use NRSV which maintains the six different terms for Law. Print each of these terms on a separate piece of poster paper. Read each one and pass it to a worshiper who is invited to stand at the front. Give the more complicated words to older worshipers – maybe “ordinance” to a lawyer – and simpler words to younger worshipers. Point out that they are synonyms, they are different words for the same thing. Instruct poster bearers to raise their poster as they hear their word in the psalm. As you read the verses, pause when you come to each poster word. 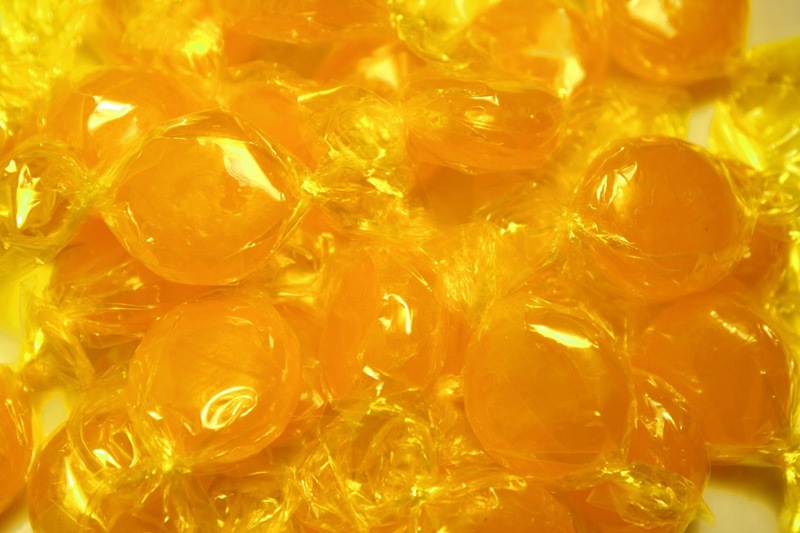 > In honor of verse 10’s claim that the Law is sweeter than honey, give all worshipers a hard candy (perhaps honey flavored) to savor as they listen to a sermon about wisdom and the Law. > “I can take it because God is with me” is the simplest summary of these verses. Children quickly identify what Isaiah was facing (people beat him, pulled the hair in his beard out, spit in his face). Because this text also appears on Palm Passion Sunday, Isaiah’s woes can be compared to Jesus’ woes on Good Friday. Both of these then lead to identifying woes children can face today with God’s help. If you go this way, be careful not to suggest that children should simply endure any abuse that comes their way. Bullying and most of the abuse children face needs to be confronted rather than just endured. Isaiah does insist that we not believe the bad things people say and do to us indicate that we are bad or worthless people. God loves us and takes care of us. God says we are worth it. This is another psalm I’d skip with the children today. There is just too much else in the other texts and too many complications in this psalm. It is too easy for children to hear one psalmist’s prayer of thanksgiving for getting what he prayed for as an indication that they will get everything they pray for. They do test this out and learn it does not work. Sorting this out with children is most easily done one on one with all the specifics rather than in the sanctuary with generalities. [retrieved August 20, 2015]. Original source: http://www.flickr.com/photos/90155419@N00/3109267228/. > Display this art depicting our dangerous tongues. Name each of the snakey tongues with ways we use our tongues to do harm – name caller, angry mean yeller, teller of lies about me (to make me look good), teller lies about others (to make them look bad), teller of secrets I promised to keep, stick out (no words just stick out the tongue), explainer (trying to prove I’m really OK when I really am not). In an informal setting children can help you name the tongues and maybe come up with some others. > Use these tongues to create a responsive prayer of confession. The prayer below could be printed for all to read. Or, the congregational response could be printed and the congregation instructed to respond when the leader pauses. 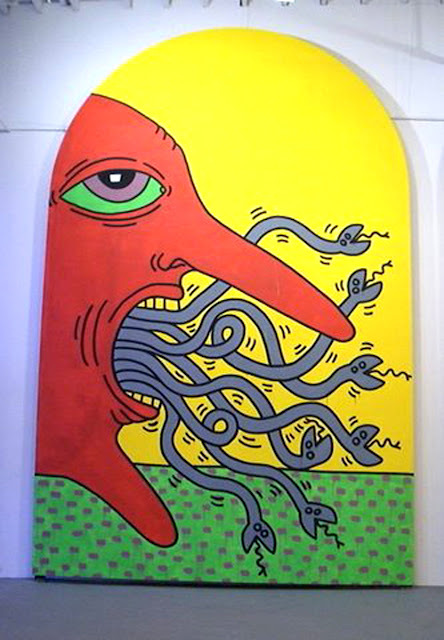 > Children can understand that the biggest problem with our tongues is that we can’t unsay anything. Once we say it, it is out there. Apologies help, but the hurt is still there. > This is also a chance to explore the old adage “Sticks and stones may break my bones, but names can never hurt me.” The fact is that names DO hurt. 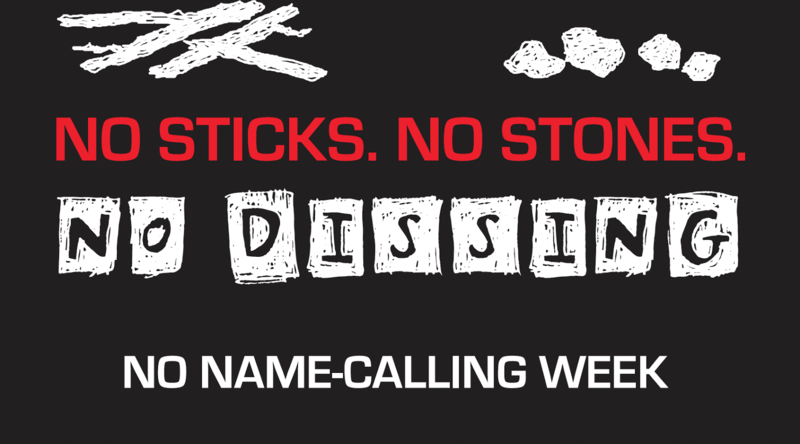 When people are called nasty, dirty names they know what the name caller thinks of them – and that hurts. Those people can be strong, not believe the name caller, and work to prove they are better than the name caller claims. But, it still hurts. > There is actually a No Name Calling Week in many schools in January. 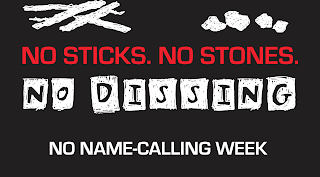 Go to No Name Calling Week to learn more about it and download some great resources. There would still be time to sponsor one in your community this January. > I’d by-pass the references to bits in horses’ mouths and rudders on ships. It is tempting to bring out the props and demonstrate them. But, they are not easy for children to turn into meaning. The horse’s bit does involve a mouth, and is used to give direction to the horse. But, the problem with the tongue is not that it directs the person, but that it misfires when not controlled. The rudder is not familiar to many children and its only point is that it is small but directs the much larger ship. Again, the tongue does not direct the person. So neither helps children grasp James’ message. > In our day of electronic communication, James’ message about tongues applies to texts, tweets, twitters, etc. as well as oral communication. 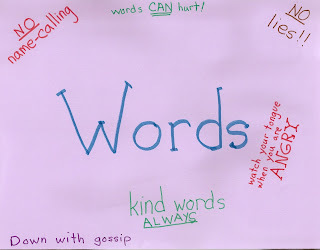 It is really the words that come off our tongues or through our fingers that are the problem. Once those words are out there, they and the pain they cause can’t be called back. For some reason many older children with their first devices seem willing to say things on line that they would never say with their tongues. They need repeated challenges from a variety of sources to save them from “learning the hard way” how much damage can be done with words on-line. If you did not use them on August 9 to explore telling truth, use these resources today to explore the ways we use and misuse our tongues. > After reading this text, display a poster featuring the word WORDS in large print. Note that tongues produce words and that most of what James is talking about is being careful about what we say. 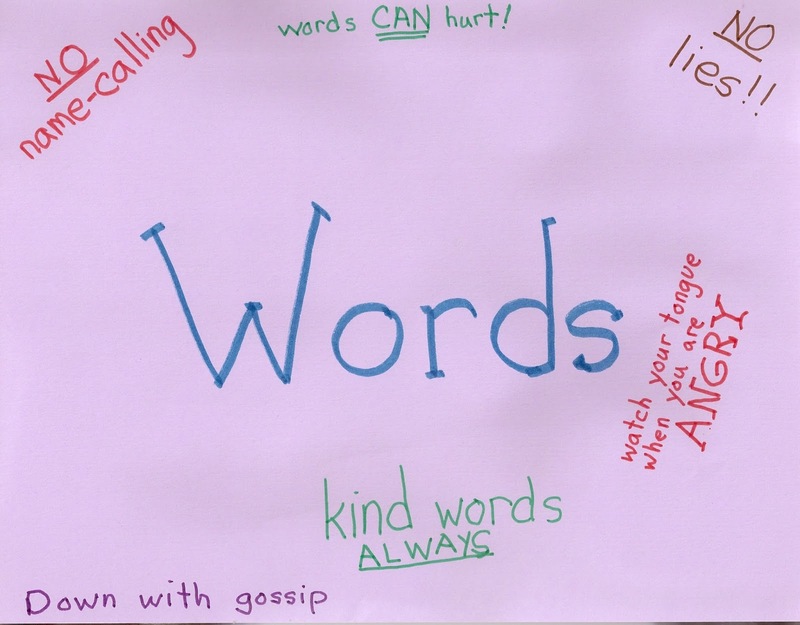 Then add phrases about specific ways we need to be careful about what we say. This could be an illustration for a sermon or a conversation with children/ all worshipers. > O For A Thousand Tongues to Sing is a perfect match for this text. Hymnals include different verses chosen for the 17(!) verses of the original. Many verses begin either “O for a thousand tongues to sing” or “My gracious Master and my God.” Point these out to worshipers and invite them to use their tongues to praise God by singing this song. > Go to On the Chancel Steps for a children’s sermon that celebrates the tongue as the strongest muscle in the body (even during football season). The ideas in it could easily become part of the real sermon and thus tempt children to listen to it – at least a little bit. > Most children think Christ is Jesus’ last name. This is an opportunity to reintroduce Jesus’ name as “Jesus, the Christ” and to explore what the title Christ means. In simplest terms, Christ is God’s special leader. When Peter said “You are the Christ” he was saying you are the special leader from God for whom we have been waiting for centuries. > Create a litany in which the leader tells events in Jesus’ life ending with a statement about what people said about him to which the congregation responds with “We say, you are the Christ.” For those of you who have copies of the Forbid Them Not series, go to Year B, page 151 to find a complete script. Others can create their own version of this. > Children hear calls to “take up your cross” literally. They need to be told that Jesus is not calling us to pick up a wooden cross. He is not even calling us to wear cross jewelry or tattoos. He is calling us to do hard things to love God and other people – even when they hurt us. Similarly, “deny yourself” needs to be translated to mean think about others first. Do not think about what I want, but what they need. This starts with everyday events like putting down your video game to play with your younger brother so a parent can get some work done.